Tourist areas at Windsor Castle and the Palace of Holyroodhouse are to undergo a £37m revamp, the Royal Collection has announced. 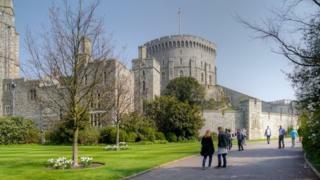 A new cafe will be built in the medieval undercroft at Windsor Castle in Berkshire as part of a £27m project. The remainder of the cash will go towards the redevelopment of outside space at Holyroodhouse in Edinburgh. The transformations are aimed at giving the public greater access to two of the Queen's official residences. At Windsor Castle the original entrance hall will be reinstated and improved access to the ground floor state apartments will be introduced. The new cafe, which was trialled temporarily several years ago, will be housed in the 14th Century undercroft - an area originally used for the storage of wine and other provisions. The transformation will also include a visitor centre and a dedicated learning centre with facilities for schoolchildren. People touring the castle will also get to see the state entrance and have a choice of routes through the state rooms. The outside space - including Holyrood Abbey, the grounds and forecourt - will be redeveloped in partnership with Historic Environment Scotland. The Abbey Strand buildings, which sit just outside the palace gates, will be restored to house a learning centre. Jonathan Marsden - director of the Royal Collection Trust, which is funding the work - said: "People have been visiting Windsor Castle and the Palace of Holyroodhouse for centuries and now more than 1.5 million do so every year. "We want everybody to have a proper sense of arrival, to be able to make choices about how they go about their visits. "We will interpret the palaces and collections in new ways, open up new spaces to the public and we're going to create two purpose-built learning centres." Work is due to begin early next year and is expected be completed by the end of 2018. Both residences will remain open to visitors.